Located on Bastimentos Island, in the popular Bocas del Toro Archipelago of Panama this beautiful 7.5 acre Surveyed Waterfront property comes with TWO(2) 28'x40' Houses, a LARGE SHOP 20'x30' well lighted with clean concrete floor, a Greenhouse for veggies and orchard of fruits, with nearby sandy beaches, and BREATHTAKING VIEWS. 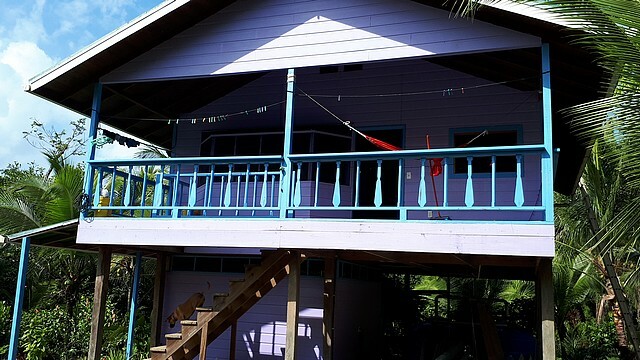 We are just 15 minutes to town, shopping, international airport, and of course the island lifestyle with all the local activities Bocas has to offer. The property provides an easy accessible entrance of 10'-30' depth into it's well protected bay and offer the water depth necessary for a sailboat and enough space for additional docks, moorings, or have a close-in location for a small marina this just minutes to town. This beautiful property also has a NATURAL ROCK POOL to cool off and a Year-Round freshwater stream. Dip your head under the cascading cool water as it falls into pool. Now, listen to the tropical birds and watch for the white-faced monkeys and sloths.... Oh, and watch for the little Red Frogs hiding in the area (We've seen Red, Yellow, and Green frogs!) At night you'll see hundreds of Lightening Bugs making the grassy field look like big city lights sparkling in the dark! The NEW HOUSE IS MOVE IN READY. The House #2 (3 year old) is a 2 bedroom, 1 bath with walk-in shower, and can be used as a rental. INCLUDED IN THE SALE is a 23' launcha with a gas-sipping Yamaha 4-stroke 70Hp. You can easily build several over the water "casitas" or on the property. The property has an orchard filled with limes, oranges, and "limon, mandarinas". In addition are coconuts, 5 types of bananas, plantains, cacao (chocolate), papayas, water apples, sweet pineapples, beautiful tropic flowers, with acres more for more plants and gardens. Plus, there is a "Spring Box" that provides 1,000 gallons per day of cool mountain spring water, this fills a 200 gallon tank. The SOLAR SYSTEM is "Oversized" with NEW 7,300 WATTS (24) 305 watt panels, and (6) large 48 volt saltwater Aquion batteries. Power cables are buried and encapsulated in tubing from the shop to both houses, the greenhouse, and includes power to the end of the dock! WiFi and celphone signal is available.